Scientists Document Domesticated Potatoes Were Eaten in the American Southwest 10,000 Years Ago. Special Offer: FREE Organic Certified Reddale Seed. NOSB Fumbles the Organic Ball in Jacksonville. Notable Quote: Francis Thicke on Hydroponic Deception. Recipe: Home Made French Fries. Final Grading of Adirondack Blue Potatoes on Wood Prairie Family Farm. Circa 2017. 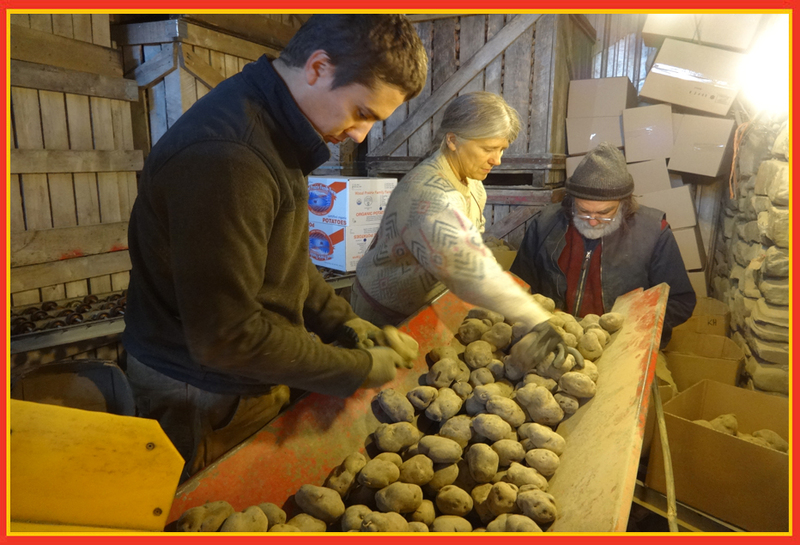 Here, recently, Caleb, Megan and Jim are putting up and boxing an early wholesale order of beautiful Adirondack Blue potatoes. Our organic seed potato crop is all in storage and the tubers have come through the suberization (wound healing) process. We’re beginning to clean and pre-grade our potato crop on our “long grading line.” Potato storage temperature is down to the low 40s and we’ll keep dropping the temps with cool night time air until we bottom out at 38oF for the rest of the winter. Outside, it’s mid-November in northern Maine and it looks the part. Area ponds are freezing over, the ground is now frozen hard, and every second or third day we get a dusting or more of snow. Caleb is busy putting away farm equipment and getting the yard cleared out and ready for a winter’s worth of snowplowing. Life never slows down on a farm but we always do take off Thanksgiving because it’s one of our favorite holidays. We’re happy working on our farm and grateful for your friendship and loyal business that let’s us keep farming. We hope you and your family have a wonderful Thanksgiving and that as winter settles in your woodshed is chock full of dry firewood for the long nights ahead. "The Potato Harvest" circa 1882. Watercolor by British painter Thomas James Lloyd (1849 - 1910). Special Offer: FREE Organic Maine Certified Reddale Seed. We have been growing the rugged and reliable Organic Reddale potato for over 30 years. Reddale is a bright, beautiful early Red which gets right down to business and grows fast. High yields, good taste and keeps all winter in storage. After your first time growing Reddale, you’ll wonder how you ever got along without it. Now you can give Reddale a try and it will be on us. Receive a FREE 1 Lb. 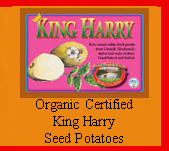 Sack of Organic Maine Certified Reddale Seed (Value $11.95) when your next order totals $49 or more. FREE 1 Lb. Sack of Organic Maine Certified Reddale Offer ends 11:59 PM on Monday, November 20, 2017, so better hurry! Please use Promo Code WPFF416. Your order and FREE 1 Lb. Sack of Organic Maine Certified Reddale Seed must ship by May 5, 2018. Offer may not be combined with other offers. Please click today! Organic Reddale. One of the very best early Reds and a customer favorite. Comparing Potato Starch. From today and 10,000 years ago. Here is a fascinating story which is re-writing the history of the potato in the Americas. Anthropologists have now determined that indigenous people in what is now called the Escalante Valley in southern Utah were eating a cousin of our modern Solanum tuberosum potatoes as long ago as 10,900 years ago. The domesticated wild species, Solanus jamesii, was identified from small amounts of starch found on cooking tools excavated in an archeological dig. Scientists have additionally confirmed these ancient potatoes were used as a human food source over the course of at least 4000 years. Then and now starch molecules were examined by powerful microscopes and shown to be one and the same as what is known as the ‘Four Corners’ potato. While modern-day locals have grown the petite ‘Four Corners’ potato for many generations, no one had any idea that their cultivation extended back 10,000 years to the dawn of agriculture. DNA analysis provided evidence the ‘Four Corners’ potatoes are not originally native to the Escalante Valley. Therefore, scientists feel that long distance trade must have been involved in their introduction into the area. Many questions are yet to be answered including who first brought the ‘Four Corners’ potatoes into the Escalante Valley, when and by what route? The remarkable article in Science Alert offers additional details plus links to the research study and contains an excellent MUST WATCH! video (6:28) describing the pioneering work of University of Utah scientists and locals who have protected and grown the Four Corners potatoes for many decades. The National Organic Standards Board (NOSB) is the fifteen member citizen-expert stakeholder advisory body to the USDA National Organic Program (NOP). The NOSB was created by the organic labeling law, the Organic Foods Production Act of 1990 (OFPA). At the recent NOSB meeting, held earlier this month in Jacksonville, NOSB members had the opportunity to stand tall and reinforce support for a clear 2010 NOSB ruling which - on a resounding 12-1 vote - banned soil-less “Hydroponic” production from organic farming. Sadly, the NOSB fumbled and egregiously failed to uphold organic integrity. In a pivotal 8-7 vote, the NOSB refused to ban fake “organic” crops grown in soil-less systems in which the plants are fertilized with a prohibited diet of water-soluble nutrients. A study of the hundred-year history of organic farming would show that it was founded and continues to serve as a challenge to the reductionist tendencies of “modern” agriculture which has come to believe solutions are to be found in purchased bags and bottles of toxic chemical inputs. The tenets of organic farming, on the other hand, have a deep, abiding faith in nature. Authentic organic farming in founded upon building up the soil as the means of growing nutritionally-dense crops which are superior, strong and free of predation by insects or disease. The popular adage coined by organic pioneer J.I. Rodale in the 1940s sums it up well: Healthy Soil = Healthy Plants = Healthy Food. In recent years the USDA Secretary has stacked the membership on the NOSB so that it has become weighted heavily with corporate members. Sadly, the corporate bloc is primarily concerned about growing industry sales. This corporate bloc’s tendency is to not respect the law, not acknowledge historical requirements that organic farming be soil-based, and all too often fail to protect the legitimate rights of organic eaters and honest organic family farmers. Our friend, Iowa organic dairy farmer Francis Thicke, however, is cut from a different cloth. After serving his five-year term, Francis is retiring from the NOSB and Jacksonville was his final meeting. Francis’ powerful ‘exit remarks,’ delivered towards the end of the meeting were insightful and courageous. We encourage you to take the time to read them in their entirety on the Keep-the-Soil-in-Organic website. Organic Farmers Sarah & Ryan Voiland of Red Fire Farm in MA. Supporting Keeping-the-Soil-in-Organic in Jacksonville. Notable Quotes: Francis Thicke on Hydroponic Deception. 1. Combine potatoes, oil and bacon fat (if using) in large Dutch oven. Cook over high heat until oil has reached rolling boil, about 5 minutes. Continue to cook, without stirring, until potatoes are limp but exteriors are beginning to firm, about 15 minutes. 2. Using tongs, stir potatoes, gently scraping up any that stick, and continue to cook, stirring occasionally, until golden and crisp, 5 to 10 minutes longer. Using slotted spoon, transfer fries to thick paper bag or paper towels. Season with salt and serve immediately. Fun as an occasional treat.